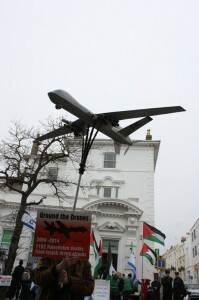 Brighton & Hove Palestine Solidarity Campaign once again took to the streets to highlight Israel’s shameful use of drones to kill and maim the Palestinian population – all in the name of ‘self-defence’. In an eye-catching event outside the EcoStream shop in Western Road, demonstrators appeared with a frighteningly realistic replica* of the killer drones regularly used by Israel to terrify the Palestinian population. 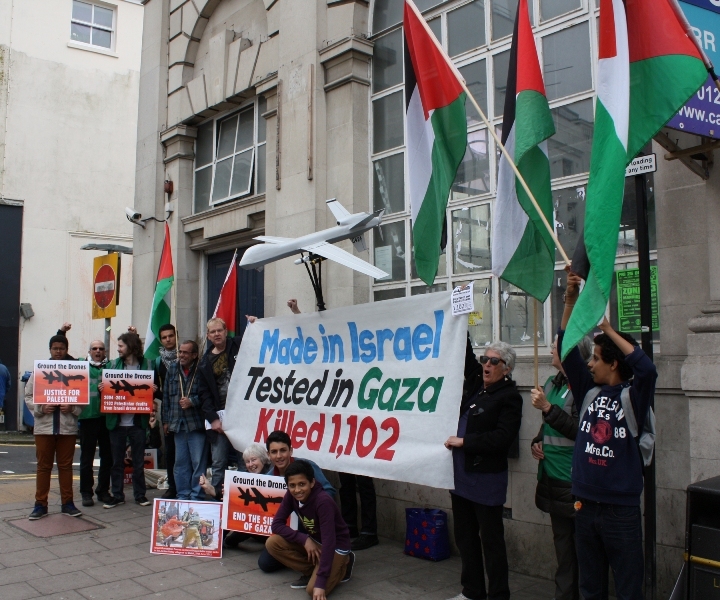 With placards, banners and leaflets highlighting the appalling record of devastation inflicted by these drones, we discussed the issues with local people, and explained the link between the Ecostream shop and Israel’s war crimes. 1,102 Palestinians were murdered in attacks carried out by Israeli drones from 2005 to 2014. To learn more about Israel’s use of killer drones, read the text below. This demo was one of many planned outside the EcoStream shop to draw attention to the wide range of Israel’s war crimes and human rights abuses, in support of the Palestinian struggle for liberation, and to demonstrate the link between EcoStream’s complicity in ethnic cleansing and the wider struggle for justice. Unmanned aerial vehicles (UAVs), commonly known as drones, are aircraft remotely controlled on video screens by ‘pilots’ on the ground, often at great distance from war zones. The two main types are: those used for surveillance and those that are armed with missiles and bombs. What’s it got to do with Palestine? Currently, only 3 countries in the world are using drones to launch missile attacks on communities in another country: the USA, the UK and Israel. Israel is one of the most heavily militarised states on earth. In 2012, its military expenditure exceeded £9.9 billion, the third highest per capita expenditure in the world. 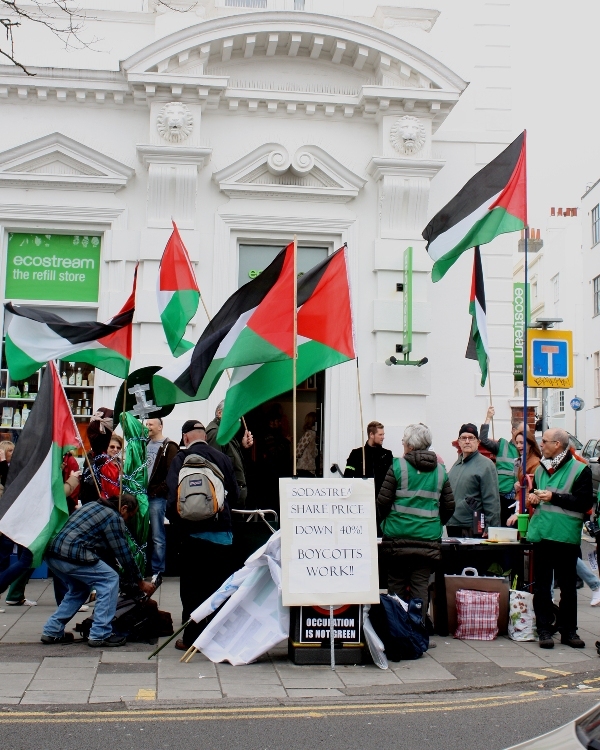 What’s more, Israel takes advantage of its armed conflicts and military assaults against the Palestinian population and neighbouring states to ‘field test’ its weapons, which companies such as Elbit then sell on the international arms market for huge profits. How many Palestinians have been killed by Israeli occupation forces? Supporters of the embargo include Nobel Peace Prize winners Archbishop Desmond Tutu, Mairead Maguire, Betty Williams and Adolfo Pérez Esquivel. For more information, visit the Corporate Watch site and the War on Want site.